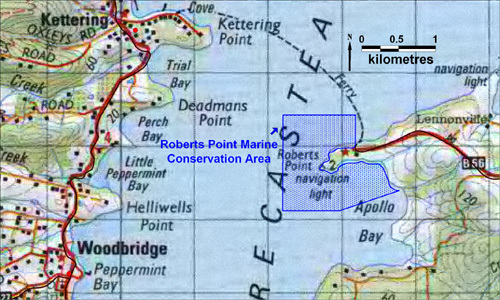 The Roberts Point Marine Conservation Area occupies 138.6 hectares in the D'Entrecasteaux Channel surrounding Roberts Point on the western side of North Bruny Island. The reserve area is subject to strong currents and low ambient light levels, providing habitat for a range of sediment communities and a vast array of invertebrate life not commonly found elsewhere. The area includes unusual sheltered deep reef habitat subjected to strong tidal currents, and a very localised black cowrie population. The area also provides a refuge for benthic faunal communities that have declined elsewhere in the D'Entrecasteaux Channel.